Some lenders pre-qualify you by just collecting a few pay stubs and eyeball your financial situation before isssuing you a pre-approval letter which may be worthless. You must provide all documents and information to get pre-approved for the first time home buyer program. Let's take a look at how the TruQual Program works. First, you fill out the FULL online application and then we email you a list of documents and information required to process your application. Usually, you will provide us with current pay stubs, federal tax returns, W2 forms, 2 months bank statements, clear copies of driver's license and social security card, and any other documentation required for the specific loan program. Next, your loan is submitted to the automated underwiting system and usually within 30 seconds you know if your loan is approved or not. Once your loan is approved you will know your maximum loan payment and approximate price range. You are issued a pre-approval letter and you can start house hunting. Next, you will email us a listing of a home you are interested in and we determine if you qualify for that specific property based on the current mortgage rates as well as correct property taxes and home insurance quote. Here is a real life example what happens when you don't get a "real" pre-approval. Josh and Rachel were excited about buying their first home so they went to their bank and they pre-qualified them for a $150,000 loan. They started looking for the home of dreams and they found one for $140,000 which was below the $150,000 pre-qualifed amount. They wrote up a contract and their offer was accepted by the seller. Next, they had a home inspection done for $250 and they paid $450 to the bank for an appraisal of the home's value. Two weeks later the loan was denied and Josh and Rachel were left with shattered dreams. The reason their loan wasn't approved was the fact that the property taxes were higher than the estimated taxes used for the pre-approval and there were unexpected association dues because it was a townhome. 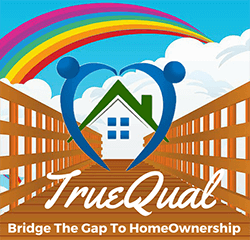 If they would have gotten pre-approved through the TruQual Pre-Approval Program they would have found out that they didn't qualify for this home before putting in an offer. Josh and Rachel were devastated and they came to us a year later to get pre-approved through the TruQual Program, found a great home, and today they are very grateful and happy homeowners. Today, the pre-approval loan process is more complicated than ever so you need to start somewhere. If you think you are ready to obtain a "TRUE" pre-approval letter then complete Full Pre-Approval Application. Otherwise, if you are unsure whether you qualify for the first time home buyer program or you are not ready to start the full pre-approval application process then check and fill out Quick Application. Once you complete either Quick or Full application then we will contact you to discuss your qualifications and possible loan options as well as answer any questions you may have about the home buying process. Don't wait another second to pursue the dream of owning a home and start your journey on the road to homeownership today.